Solar powered lights are a great alternative to grid electricity. 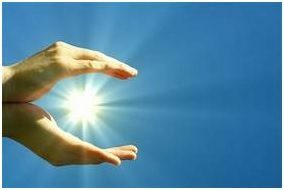 Solar energy comes from the sun. It converts into electrical or thermal energy. Solar lighting is an evolving area of our national infrastructure and economy. It will play a crucial role in everyday life for many years. Solar cells and solar technology enhance and improve solar light applications and products. Solar power essentially harnesses solar energy and converts it to electricity. 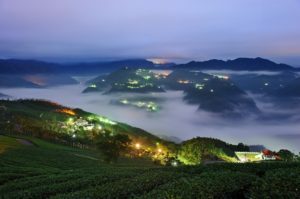 As technology such as solar panels has multiplied, the most popular use of the technology is manifested in solar garden lights, lamp post lights, and security lights. Solar powered technology innovations have started to have a profound impact on residential use. Outdoor solar lights are invaluable for a range of illumination requirements. Listed below are seven reasons to buy and use solar powered lights. People are often surprised by the steps and frustration that accompany installing a traditional lamp post. Depending on the fixture, the installer may have to lay appropriate gas or electrical lines and pour a hefty concrete base to prevent gas lines or wiring from shifting. Regular maintenance will be necessary for years to come. But if you opt to install solar lamp posts, all the hassles of digging, wiring, pouring, and leveling can be eliminated. These are durable and efficient lighting fixtures and need only the sun’s light to operate for hours. The number of styles and designs, as well as the LED technology advancements in solar post lights, is staggering. Outdoor solar lights of any kind compete with traditional fluorescent lights. The beauty of choosing solar fixtures and lamps means the expensive, risky, and time-consuming tasks like changing bulbs may only happen once in a few years. Solar lamps are “off the grid” which means they don’t require the support of the public electrical grid. This means you save money on electriciy. The purchase price and some occasional LED light replacements are the only costs to solar powered lights. And you are helping save energy and the environment. Solar lamp posts are more than earth-friendly alternatives. Today’s options feature heavy-duty materials, dusk to dawn sensors or onboard timers, motion sensors, and powerful lamps that have residential applications. Solar lights often have stylish designs. They are also made to serve particular functions. When incorporated into a home security system, they illuminate dark entryways or yard areas. They can be placed near walkways or stairs that are hard to navigate in the dark. Solar fixtures and lamp posts provide incredibly affordable, long-lasting, and easy exterior lighting options. Little time is required to install them. There is almost no maintenance. 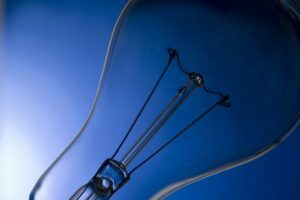 Owners save thousands in electrical usage over the lifetime of the lights. The rapid developments that are taking place in the solar energy field are a benefit to modern gardeners. A garden can be gently lit in the evening. Solar powered lights are widely available. Solar lighting can illuminate pathways. Floodlights powered by solar energy can be installed to shine on vegetable gardens, fountains, and beautiful flowering trees. Standard fixtures need no tools to connect. Someone with no knowledge of wiring or electricity can install them. The solar fixtures have chargers connected through durable wires or built-in. They can be relocated simply and quickly. Rarely does a light bulb require changing. Solar lighting adds a new dimension to most beautiful gardens. They cost nothing to use. Millions of people have an attached patio or deck. Many have a single, wall-mounted fixture that illuminates the area after dark. Frequently, it is an unappealing “spot” light people would like to avoid. Often the solution is temporary lighting sources such as tiki torches or candles. Those choices can be dangerous, time-consuming, and costly. They do not provide durable or real illumination. Investing in hard-wired options is sometimes frustrating because of the limited range of lighting solutions used around a patio or deck area without a lot of required electrical work. The ease of installation and the range of solar lighting fixtures make them an irresistible choice. Solar lighting fixtures are available in hook-mounted, wall, and pole options that are equipped with light and motion sensors that allow them to function efficiently. A configuration for solar deck lighting serves as security and recreational illumination thanks to floodlights, solar spotlights, and motion sensors that are aimed and used wherever and however necessary. Solar lighting fixtures are superior to standard electrical units Outfit the entrance of the deck with a wall-mounted, decorative accent fixture above the doorway of the home that leads to the deck. It can automatically run from dusk to sunrise or be outfitted with a timer. At fixed locations like beside a stair rail, decorative fixtures can be mounted, or solar lamp posts can be set in corners. Solar flood lights placed around the yard ensure pathways are clear, lightly darkened areas or accent ornamental trees. 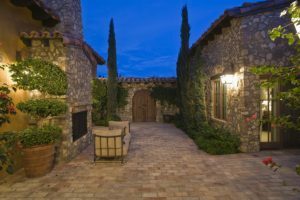 Entrance areas or any gates for a patio or deck can be outfitted to illuminate them with motion sensor lights when an owner or visitor approaches but is programmed to turn off in minutes when triggered. The number of solar lighting options for patios and decks is in the dozens. The fixtures available in hardwired arrangements are not as easy to install. There is a cost involved when hiring a professional electrician and in a monthly electricity bill that just don’t apply to solar lighting. Horseback riding enthusiasts dream of an arena of their own. Even when they have the land and an established arena area, equipping it for night and day use seems cost prohibitive. Solar lighting is an excellent solution to the problem. Electrical requirements and lighting are most of outdoor riding arena creation. Most arenas have several pole mounted fixtures and additional locally placed light. To keep riders safe and horses calm, the field must be flooded with light. Horses are spooked easily by shadows. A lot of lighting and electricity can solve the problem. Solar lights provide a better solution. Super bright solar fixtures are capable of broadcasting 30-foot radius lighting. The units can be placed on the ground, set on posts, or mounted to buildings. The owner installs the units and begins night time riding. Many are equipped with on and off switches and photocells that work automatically at dusk and dawn. Lights operate when the owner needs them.